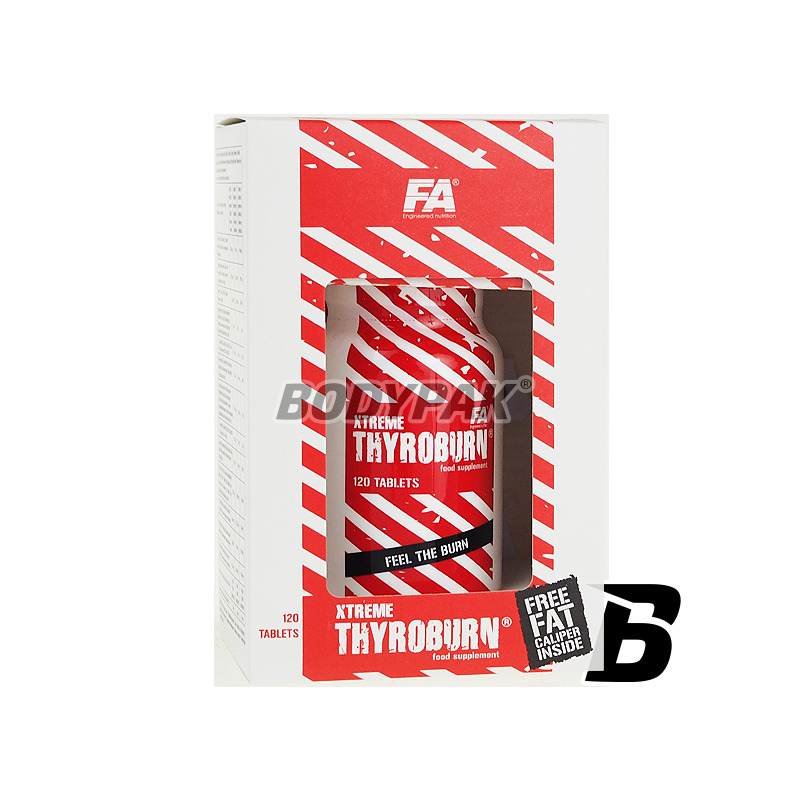 Fat LossFA Nutrition Xtreme Thyroburn - 120 tabl. 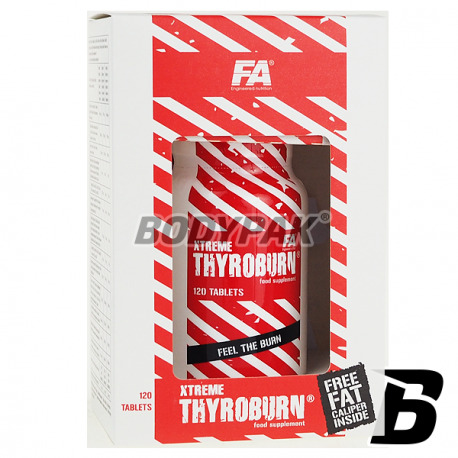 FA Nutrition Xtreme Thyroburn - 120 tabl. The new, even more effective formula of the popular thresholds you, which is based on natural plant extracts. To loose weight healthily and safely. The force of the fluid nature! The popular and well known for its effectiveness "fat burner" in the new more perfect formula with powerful composition, a special gel capsules for superior absorption, packed in practical blister packs. All active substances Xtreme Thyroburn® are closed ,, '' in a special gel capsules, which guarantees successive gradual release of the body to fatty acids constituting a medium, wherein the suspended active ingredients also have a protective effect on the stomach wall after ingestion makes the product completely safe. The great advantage of gelatine capsules is the fact that they are hermetically sealed and which protects the active ingredients in them closed against oxidation and occurring in the result of adverse changes. The smooth texture of the capsule and its bezsmakowość are additional benefits of the product, which becomes easy to swallow. Xtreme Thyroburn® a highly advanced and powerful action of the product comprising the components of the metabolic stimulators of natural ingredients lipotropic action, by which a synergistic effect of increasing the processes of thermogenesis and help achieve lean fat mass. Green tea extract contains flavonoids, flavonols, tannins, minerals, free amino acids, and methylxanthines. The action of these compounds manifested by stimulating thermogenesis, as well as antioxidant and energizing. Vitamin D3 - as shown by scientific research can have a positive effect on testosterone production. This is extremely important during the reduction as it allows to maintain a hard, muscular figure and prevents loss of muscle tissue. Vitamin D3 also impacts positively on the maintenance of healthy bones which is extremely important for the competitors practicing forcefully. Chromium - contained in XTREME THYROBURN® may contribute to the proper metabolism of carbohydrates and fats, and is responsible for stabilizing blood glucose levels. Thanks to root minimize the risk of sudden attacks of hunger and snacking. Medlar Japanese - Working synergistically with the other components of the Japanese medlar, research suggests, can directly affect the aerobic capacity performance athletes. Increased aerobic fitness is better cardio and increased energy demand. With the XTREME THYROBURN® fat burning has reached a new unprecedented level. -lipoic Acid - acts as a potent adjuvant antioxidant protection against free radicals and increases the oxidation of glucose and fat metabolism. Fenugreek - helps reduce body fat levels. In addition, it has a strong hypoglycemic action of lowering blood sugar. It has a high concentration of choline and betaine. Schisandra Chinese - used for thousands of years, entered permanently into the history of Chinese medicine, extremely effective adaptogen. Its effect can be felt with long-term use, reduces the effects of stress and calming effect on the whole body. Additionally advantage is its ability to positively influence detoxifying the entire body especially during increased physical activity and weight reduction. Camomile extract - exhibits a vasodilator action, is known for its anti-inflammatory and detoxifying. Extract, yerba mate - fat reduction is inextricably linked with a deficit of calories, which negatively affects our cognitive skills, concentration and mood. The extract of yerba mate contained in Xtreme Thyroburn® energizing and vitalizing helping to survive in the toughest moments reduction. The new version of Xtreme Thyroburn® was developed in line with the latest scientific research and tests on the athletes FA TEAM. The new composition of the force-displacement-new new effects. Train hard, Eat healthy, suplementuj wisely! Consume 3 tablets a day (before training and before meals). Do not consume more than 4 hours before bedtime. Składniki: Winian L-karnityny, substancja wypełniająca (E 460), L-tyrozyna, maltodekstryna, ekstrakt z liści z zielonej herbaty (Camellia sinensis L. Kuntze, 80% kofeiny), dwuwinian choliny, chlorek potasu, powłoka tabletki [substancje glazurujące (E 463, E 464), barwniki (E 171, E 172, E 102*, E 132, E 129*)], cytrynian sodu, ekstrakt z owoców tamaryndowca malabarskiego (Garcinia Cambogia (Gaertn.) Desr., 60% HCA), substancje przeciwzbrylające (E 470b, E 551), sproszkowane owoce pieprzu kajeńskiego (Capsicum annuum (Linn. )), ekstrakt z liści zielonej herbaty (Camellia sinensis L. Kuntze, 45% EGCG), sproszkowany korzeń imbiru (Zingiber officinale Roscoe), substancja wiążąca (E464), chlorek chromu (III). *Może wywierać szkodliwy wpływ na aktywność i skupienie uwagi u dzieci. Jeśli ktoś chce postawić na dobry spalacz to na pewno nie ten. Brak efektów - nie polecam..